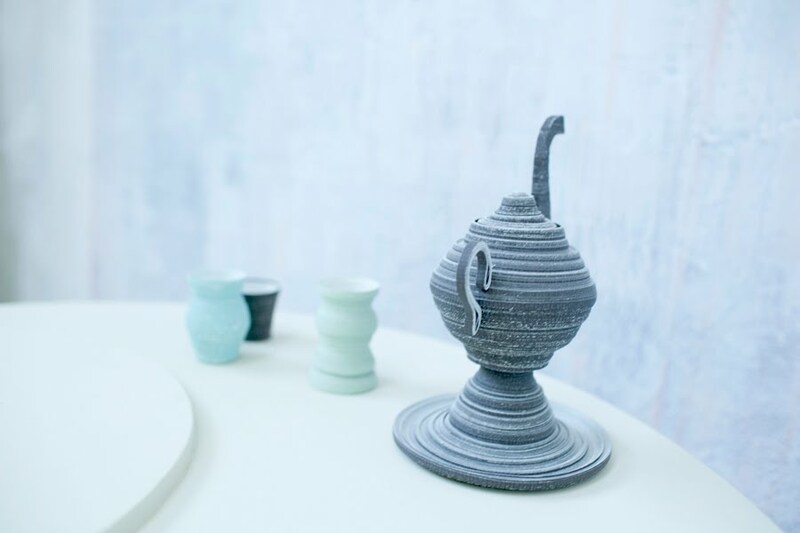 How lovely are these finely shaped vessels? Composed of cut, rolled, and glued wallpaper strips by Siba Sahabi of Amsterdam, they're an homage to the Moroccan 'tea dance' of days past. The graceful lines conjure up thoughts of slow motion in a sultry locale. While on a visit to northern Africa, Siba learned about the custom in which a polite hostess, her daughters, or servants would perform dances as entertainment for guests who had been invited for tea. As an example of Eastern culture inspiring Western culture, the custom traveled from Africa to Paris, London, and then America in the 1920s and '30s. 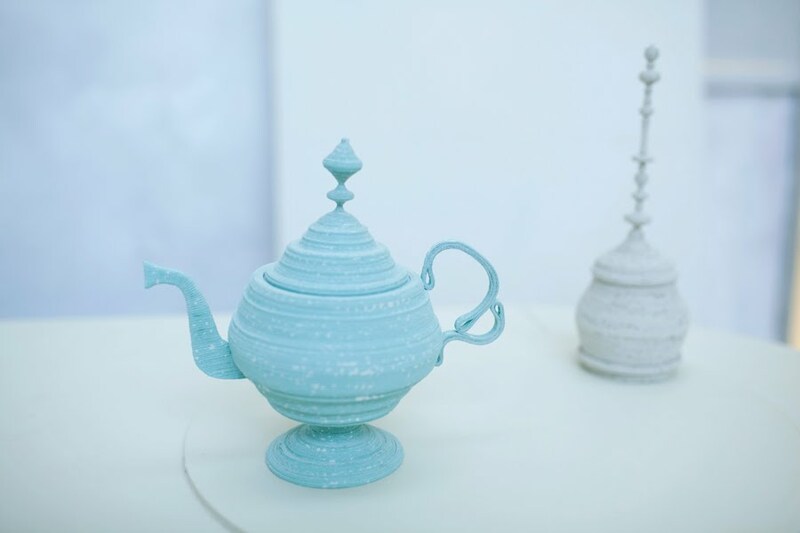 Because Siba, the daughter of an Iranian father and German mother, was raised in a home where tea drinking was associated with hospitality, the custom had personal meaning for her. She was inspired to create contemporary designs that reflect remnants of the past. 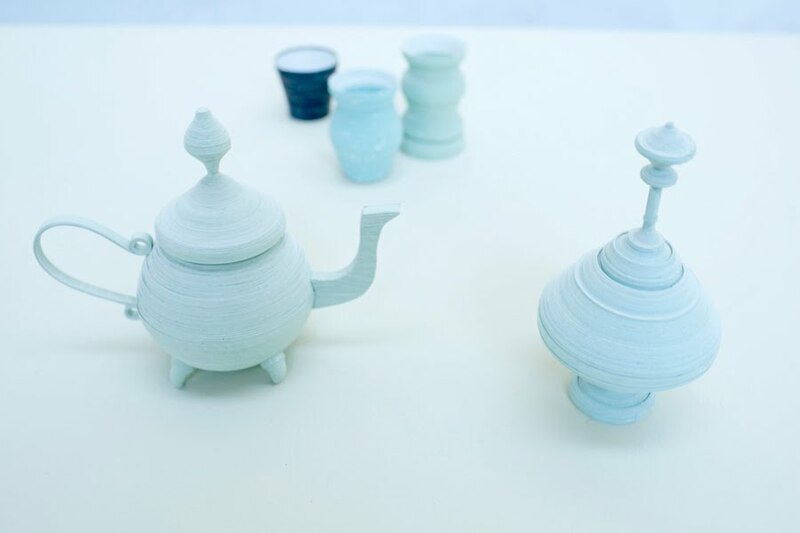 Tea Dance is currently on display through May 8 at Craft2eu's Paperficial exhibition in Hamburg, Germany. Creativity like this just blows me away. Wow. Congrats to Siba!!! Those paper vessels are just divine!!! I wish I could go to see the exhibition in Hamburg. Thank you for stopping by my blog and commenting! What a lovely post you have here. Creativity in paper astounds me! His work is admirável.Muita creativity and talent. Congratulations. Wow- that's really all I can say! What size are these? Life-size? Miniature? I'm off to check the link - maybe it says there. These are lovely! Thank you for sharing - I'm so glad I found your blog. I really like artwork made with paper, and these are certainly some exquisite pieces.